t*rexes and tiaras: Tuesday Titles 036: A Week in Paris..
Nearly twenty-five years later, Fay Knox, a talented young violinist, visits Paris on tour with her orchestra. She barely knows the city, so why does it feel so familiar? Soon touches of memory become something stronger, and she realises her connection with these streets runs deeper than she had ever expected. I'll start by saying that whilst I found this book perfectly enjoyable, I would say that was as good as it got. The story flicks between Kitty and Fay's stories in dual time, following their stays in Paris. Unfortunately, I didn't find that either of their characters particularly spoke to me. Both musicians, Kitty and Fay have found themselves in Paris for that reason, and the similarities between their lives doesn't stop there. Their relationships blossom in the same way as each other, whilst in the city of romance. 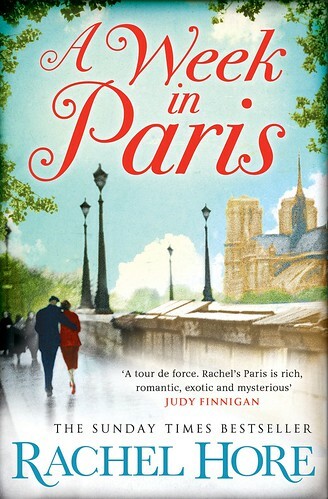 Fay spends a lot of her time in Paris trying to establish why she feels such a strong connection to the place, almost as though she has lived there before and thankfully manages to track down some people who can help her. Kitty's tale describes the Paris during WWII, with harrowing accounts of the poverty and dreadful living conditions experienced by so many people living in fear at the time. I felt that the two lives were so very similar at certain points that it could get a little confusing. But a charming, easy read and one to while away a rainy afternoon with. Ah, I think it's one you'd enjoy! Oh, I think this is the first one of hers I've read. Enjoy!